Aside from gazing into Thomas’s eyes, one of my favorite parts of Montreal was exploring the food. (No surprise there, really.) I soaked it all in, from the huge variety of locally grown apples and other produce at the Marché Jean-Talon, to the elegant display of, well, everything really but especially the breads, fresh meats and wild mushrooms at Les 5 Saisons. We even found our namesake wine in the SAQ — a pinot noir from California. Is that cool or what? And the eating. I ripped apart many, many buttery croissants, each downed with steaming hot café au lait. The one day I eschewed a croissant was when I needed to save room for brunch, the always-impressive smoked meat sandwich at Schwartz’s. It was a delicious trip. Now that I’m back to dreary grey skies heavy with rain in Vancouver, I wanted to see if I could keep the Montreal vibe going just a little longer. The answer is yes: Oven roasted chicken with maple mustard pan sauce. This is a simple dish that draws on a few classic French techniques to deliver an impressive meal, perfect for fall, and in under 30 minutes. The first technique is pan roasting. This is where you sear the chicken in a hot sauté pan first, then put the pan in a warm oven to finish cooking. It’s a method that restaurant kitchens use a lot, but it’s very simple to do at home. The second technique is to deglaze the pan (with chicken stock and the rest of the sauce ingredients) and reduce it for a few minutes. The third technique, the crowning touch, is to finish the sauce with a small amount of cold butter. 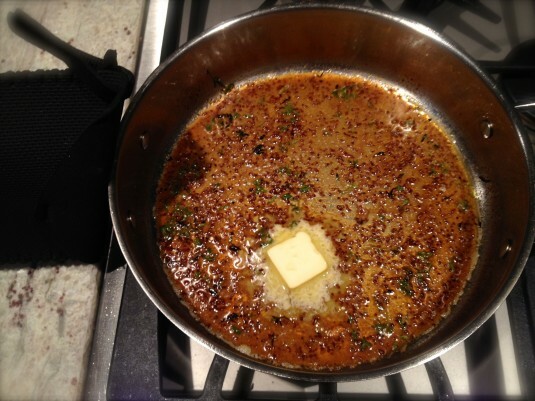 The butter helps to bring the sauce together, thicken it a little and gives it a luxurious, oh so velvety texture. And that’s it. Simple, hey? With a kiss of maple syrup, the tang of grainy mustard and the rich butter finish, I had a fall bistro classic that would have fit right in on a Montreal menu. Perhaps being back home isn’t so bad after all. 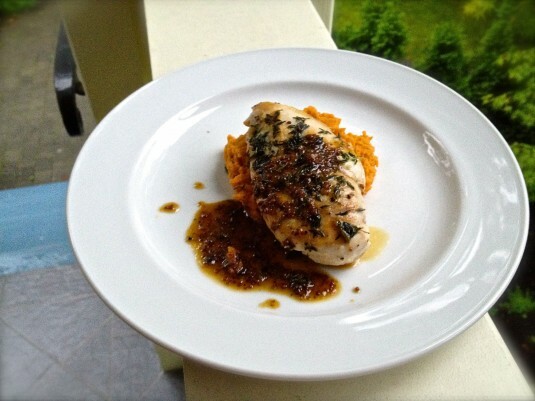 This is a super simple, fast recipe that brings boneless, skinless chicken breasts from boring to bistro classic. The maple syrup adds a touch of sweetness balanced by the tang of grainy mustard. A perfect fall dinner, especially when it's too rainy for the barbecue! Season chicken with a sprinkle of salt and pepper, and 1 tablespoon of the thyme. In a large ovenproof saute pan, heat oil over medium-high heat until the oil is hot but not smoking. Add chicken breasts and cook for 2 to 2-1/2 minutes, or until lightly browned. Reduce heat to just above medium and, using tongs, turn the breasts over to cook for 1-1/2 to 2 minutes. 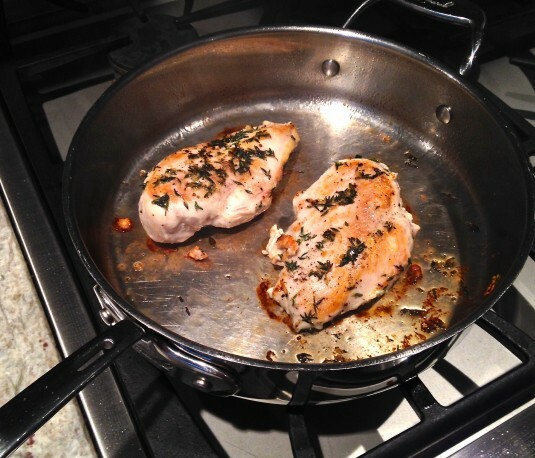 Place the saute pan in the oven to roast the chicken breasts for 6-7 minutes. Remove saute pan from oven and -- this is important -- immediately place an oven mitt over the handle. With the hot handle safely covered, remove the chicken breasts to a plate and cover with foil while you make the sauce. Over medium heat, add the chicken stock, maple syrup, mustard and 1 tablespoon thyme to the saute pan and scrape up any bits from the bottom of the pan. Reduce the sauce down to 3-4 tablespoons, stirring frequently. This will take about 4-5 minutes. Add cold butter and whisk to incorporate. 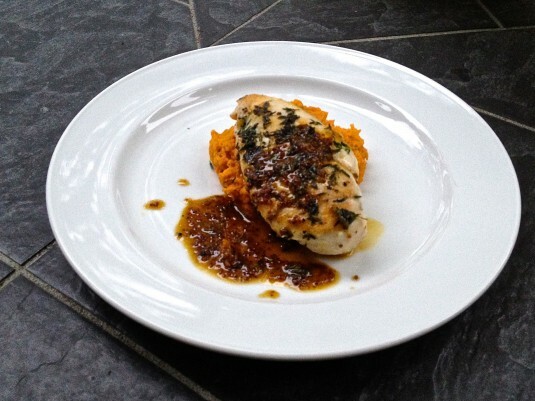 Plate the chicken, and serve immediately with the pan sauce.